"Ben Hecht′s book explains in clear language everything needed to successfully engage in nonprofit housing development. He tells how to find the money, how to generate good design and quality construction, and how to improve management a complete, well–researched, and well–presented ′A to Z′ approach." "Ben Hecht′s book makes the affordable housing development process accessible for communities and practitioners everywhere. Developing Affordable Housing should be on the bookshelf of every organization that cares about people and wants to make affordable housing possible." "The development of affordable housing is as much a journey as a destination. Ben Hecht′s book provides maps and bridges while not losing sight of the challenging but elusive goal of providing decent, safe, and affordable housing." "In our work to increase the supply of safe, decent homes for those who need homes the most, we appreciate the power of partnerships and the value of information. So does Ben Hecht. 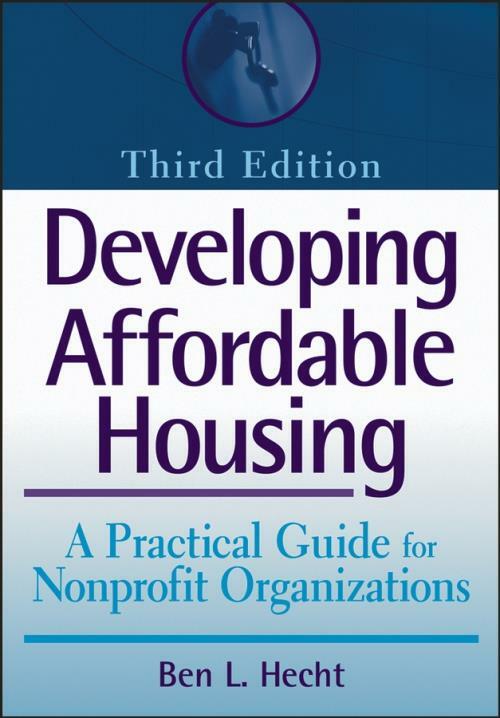 Developing Affordable Housing is more than a practical guide for nonprofits it′s a library, a trusted advisor, and a road map. Read this book and benefit from its wisdom." Chapter 1: Developing Affordable Housing in the Twenty–First Century. 1.2 The Current State of America s Affordable Rental Housing. 1.3 The State of America s Working Poor Seeking Affordable Housing. 1.4 Current Trends in Affordable Housing. 1.5 Unique Opportunities for Nonprofit Organizations: Rental and Homeownership. Chapter 2: The Real Estate Development Process for Nonprofit Organizations: An Overview. 2.1 Nonprofit Organizations and the Real Estate Development Process. 2.2 An Overview of the Real Estate Development Process. 2.3 Addressing the Specific Needs of a Community and a Specific Project Site. Chapter 3: Establishing the Development Team. 3.3 The Financial Development Specialist. 3.12 Conflicts, Multiple Roles, and Oversight. PART TWO: PROJECTING COSTS, INCOME, AND EXPENSES. Chapter 4: Project Feasibility and Total Development Costs. 4.2 Determining Preliminary Project Feasibility. 4.3 Estimating Total Development Costs. Appendix 4A: Sample Letter of Value. Appendix 4B: Summary of Key Federal Regulations Governing Underground Storage Tanks. Appendix 4C: Summary of Relevant Laws and Regulations Governing Lead–Based Paint. Chapter 5: Determining Projected Income and Expenses. 5.3 Identifying Targeted Income Levels. 5.4 Determining Affordability as a Percentage of Income and Market Rents. 5.5 Income from Nonresidential Use. 5.7 Evaluating Past Operating Expenses. 5.8 Projecting Expenses Where No Operating History Exists. 5.10 The Role of Lenders. Appendix 5A: Controllability of Expenses. Chapter 6: Raising Capital to Meet Total Development Costs. 6.2 Sources of Capital Generally. 6.5 Equity and Sales Proceeds. Appendix 6A: Example of an Amortizing Loan. Appendix 6B: Example of a Nonamortizing Loan. Chapter 7: Sources of Capital: Loans. 7.1 Who are Possible Lenders? 7.2 Sources of Loan Funds from Public Lenders Generally. 7.3 Sources of Loans from State and Local Governments. 7.4 Sources of Loans from the Federal Government. 7.5 Sources of Loan Funds from Private For–Profit Entities. 7.6 Sources of Loan Funds from Private Nonprofit Entities. Appendix 7A: 501(c)(3) Bond Terminology. Appendix 7B: List of Local CDFI Organizations Financing Housing. Chapter 8: Sources of Capital: Grants. 8.1 Grants from the Federal Government. 8.2 Grants from State and Local Governments. 8.3 Grants from Private Nonprofit Foundations. 8.4 Grants from For–Profit Corporations. Chapter 9: Sources of Capital: Equity. 9.1 Creation of an Equity Fund for Housing Development. 9.2 Use of the Low–Income Housing Tax Credit. Appendix 9A: Tax Credit Information Resources List of State and Regional Tax Credit Equity Funds. Appendix 9B: Partial Listing of Low–Income Housing Tax Credit Tax Syndicators. Chapter 10: Sources of Capital: Public Housing Funds. 10.1 How Public Housing Resources Contribute to Affordable Housing. 10.2 Mixing Public Housing Capital with other Capital: Mixed Finance. 10.3 Uses of Public Housing Funds in Mixed–Finance Transactions. 10.4 Considerations in Mixing Public Housing Development Funds with other Sources of Affordable Housing Funds. 10.5 Elements of Public Housing Development Transactions. PART FOUR: ENHANCING FEASIBILITY AND PACKAGING THE PROJECT. Chapter 11: Enhancing the Feasibility of an Affordable Housing Project. 11.1 Increasing Access to Capital Credit Enhancement. 11.2 Increasing Access to Capital Loan Sales on Secondary Market. 11.3 Reducing Total Development Costs. Chapter 12: Developing the Project Feasibility Report: Six Case Studies. 12.2 The Feasibility Report and Financial Pro Formas. 12.3 The Development of Affordable Housing: Six Case Studies. Appendix 12A: The Whitelaw Reference Information. Appendix 12B: Friendship Court Reference Information. Appendix 12C: Garden Terrace Reference Information. Appendix 12D: The View Reference Information. Appendix 12E: Kentucky Mountain Housing Reference Information. Appendix 12F: Lease–Purchase Reference Information. PART FIVE: PURCHASING AND DEVELOPING THE PROPERTY. Chapter 13: Securing Site Control over the Property: Signing the Option or Purchase Agreement. 13.2 Site Control Must Be Secured in Writing. 13.3 The Use of Purchase Contracts. 13.4 The Use of Options. Appendix 13A: Documents Pertaining to Purchase Contracts. Appendix 13B: Documents Pertaining to Option Agreements. 14.2 Applying for Financing and Operating Subsidies. 14.3 Determining the Ownership Entity Generally. 14.4 Determining the Ownership Entity Corporations. 14.5 Determining the Ownership Entity Partnerships. 14.6 Determining the Ownership Entity Factors. 14.7 Establishing the Ownership Entity: Divided Ownership and Leasehold Interests. 14.8 Interviewing and Selecting the Management Company. 14.9 Developing Plans for Renting or Selling Units. Appendix 14A: Monthly Management Reports. Chapter 15: Partnerships and Joint Ventures. 15.1 Issues Concerning Organization s Tax–Exempt Status. 15.2 Options for Structuring the Relationship. 15.3 Partnerships and the Use of the Low Income Housing Tax Credit. Appendix 15A: Joint Venture Checklist. Chapter 16: Purchasing the Property: Settling on Acquisition. 16.1 The Settlement Process Generally. 16.2 The Role of the Settlement Agent. 16.4 Selecting the Settlement Agent. Appendix 16A Settlement Checklist and Sample Documents. Chapter 17: Constructing or Rehabilitating the Property: Settling on the Construction Loan and Surviving the Construction Process. 17.2 Settling on the Construction Loan. 17.3 The Construction Process The Participants and Their Responsibilities. 17.4 Technology in 21st Century Affordable Housing Construction and Rehabilitation. 17.5 Negotiating the Construction Contract and Bidding. 17.6 Elements of the Construction Contract. 17.7 Rehabilitating an Occupied Property. Appendix 17A: Construction Process Checklist and Sample Contractor Agreements. 18.2 Introduction to Selective Rehabilitation. 18.3 Managing Selective Rehabilitation: Formal Versus Informal Approaches. 18.4 Implementing a Formal Approach to Selective Rehabilitation: The Rehabilitation Specialist. 18.5 Choosing A Property for Selective Rehabilitation: Building Inspection Techniques of Rehab Specialists. 18.6 Conceptualizing the Project: Rehabilitation Standards. 18.7 Designing the Project: Work Write–Ups and Cost Estimates. 18.8 Computerized Specification–Writing and Estimating Systems. 18.9 Defining Methods and Materials: Performance Specifications. 18.10 Selective Rehabilitation and Construction Management. 18.11 Selective Rehabilitation and the Contractor Pool. 18.12 The Role of Government Agency/Public–Purpose Organizations in Selective Rehabilitation. 18.13 Avoiding Gut Rehabilitation: Tips of the Trade. 18.14 Improving Energy Efficiency in Selective Rehabilitation. 18.15 Dealing With Lead–Based Paint Hazards in Selective Rehabilitation. 18.16 Dealing With Other Recurring Health and Safety Issues in Selective Rehabilitation. 18.17 Applying Construction Codes and Existing Housing Codes to Selective Rehabilitation. 18.18 Standards Issues with Funders and Selective Rehabilitation. 18.19 Information Sources and Tools for Selective Rehabilitation. Appendix 18A: Sample Documents Regarding Rehabilitation. PART SIX: COMPLETING AND MANAGING THE PROPERTY. Chapter 19: The Project Completion Phase: Completing the Development and Maintaining an Ownership or Rental Community. 19.2 Settling on the Permanent Loan. 19.3 Maintaining a Rental Property. 19.4 Developing Additional Resident Services As Part of a Comprehensive Property Management Plan. 19.5 Key Points on Setting Performance Standards for Comprehensive Property Management. 19.6 Key Points on Deciding Whether to Contract for Management or Manage Directly. 19.7 Key Points on Selecting a Good Management Company. 19.8 Key Points on Evaluating Property Management Performance. 19.9 Financial Management of Rental and Multifamily Homeownership. 19.10 Converting the Property to Homeownership for Residents. 19.11 Managing and Budgeting for Rental or Multifamily Ownership. Appendix 19A: Sample Documents and Disclosure Statements.